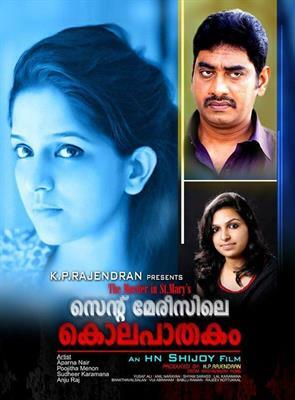 St Marysile Kolapathakam malayalam movie scripted and directed by H N Shijoy featuring Sudheer Karamana and Aparna Nair will go on floor from 17th December at Thiruvanathapuram. The movie revolves around the murder of a woman which takes place in St Mary's Working Women's Hostel. Sreejith Ravi, Rohit Menon, Poojitha Menon, Anju Raj, Indrans and Ullas Pandalam will give life to other prominent actors in the movie. The movie is produced by K P Rajendran. HN Shijoy, who has worked as an associate with Madhu Kaithapram is gearing up for his directorial debut. The movie titled 'St. Marysile Kolapathakam' featuring Sudheer Karamana and Aparna Nair in lead revolves around the murder of a woman which takes place in St Mary's Working Women's Hostel. Scripted by the director himself, the story is all about the murder investigation and the later incidents. Sreejith Ravi, Rohit Menon, Poojitha Menon, Anju Raj, Indrans and Ullas Pandalam will give life to other prominent actors in the movie. The movie produced by K P Rajendran will kick start at Thiruvanathapuram from 17th December 2014. Aparna plays a saleswoman of a leading textile shop while new face Anju Raj will also be seen in a prominent role. Aparna Nair will also play the title role in an art film 'Thamara' to be directed by Prakash. The actress who is known for her characters roles in 'Cocktail', 'Beautiful', 'Mallu Singh", 'Thattathin Marayathu', 'Run Baby', 'Poppins', 'Immanuel', Hotel California' and 'Mumbai Police' is ready to face the camera after her sabbatical. As crime thrillers have much demand, the filmmaker will try to include the essence of suspense which could keep the moviegoers intact. Movies 'Drishyam', 'Munnariyippu', 'Memories', 'Mumbai Police', 'Oru CBI Diary Kurippu', 'No: 20 Madras Mail', 'Nirakkoottu', '22 Female Kottayam', New Delhi' and 'Passenger' are few among the hundreds of thrillers which have won the hearts of the movie enthusiasts. Meanwhile, Sudheer Karamana is tight packed with projects including Shibu Gangadhar's 'Rudra Simhasanam' and V K Prakash's untitled movie. He plays Veera Bhairavan, a black magician in Rudra Simhasasanam which will have Suresh Gopi in lead. He gained positive response from the audience for his character roles in 'Sapatha Sree Thaskara' and 'Varsham'. On the other side, Sreejith Ravi is waiting for the release of his upcoming movie 'The Bail' directed by Jayalal.